When I was in grade school at Midland School half a mile east of the Red Rock Canyon property, “horny toads” were a common creatures to be contemplated during recess. Frequently, the “horny toads” arrived at the play ground in boys’ pockets. But, they usually hadn’t been transported very far. Bott Park just across the street, still native in its vegetation (or lack thereof), was a pretty good place to catch them. We all knew that you could turn a “horny toad” on its back in the palm of your hand and “hypnotize” it by stroking its belly. Some “horny toads” had white bellies, and some had yellow bellies. Folklore around school held that “yellow bellies” would give you warts. Close to home, a mile and a half south of Midland School we had a lot of lizards. They were slender, very fast and adorned with turquoise colored bibs. But we had none of the pancake shaped, awkward lizards called “horny toads.” It seemed strange to me that somewhere half way between school and home I stopped finding “horny toads” and found other lizards instead. Informed by a little maturity and education, I surmise that the range of horned lizards in my old neighborhood was limited by differences in the color of the soil. The “soil” around Midland School is Pierre Shale which is a slightly brown shade of medium gray, almost the color of our horned lizards’ backs, which provides a good background for the lizards’ camouflage. But, as the horned lizards might venture onto the yellow shale and white limestone of the Niobrara formation or the somewhat orange colored alluvial gravel they would be easily seen by potential predators. My recent reading of the little book “Horned Lizards” by Wade Sherbrooke has tended to confirm this. Sherbrooke devotes considerable attention to the horned lizards’ camouflage and its importance to their survival: Color is one important factor; and different populations living in environments with different soil colors have developed different skin colors. The low profile of the pancake shaped horned lizard also helps to make the lizard less visible to predators since it casts very little shadow. The edges of any shadow which would indicate the shape of the lizard are softened by the effect of a fringe of enlarged scales along the margin of the abdomen of most horned lizards. And, the patterns of darker coloration on their backs makes it more difficult for predators to recognize horned lizards by their shape. Horned lizards, which belong to the same family as iguanas, are native only to western North America. Their range extends over the arid and semiarid regions from southernmost Mexico to southernmost Canada. In all, there are 13 species of horned lizards. All are found in Mexico and 7 live in the United Sates. Our local horned lizards are short horned lizards (Phyrnosoma douglassi). The name short horned lizards refers to the “horns” around the back of the head being shorter than those of other species. Short horned lizards are also characterized by a single row of fringe scales along the borders of the abdomen and a deep, wide central notch between the horns on the back of the head. 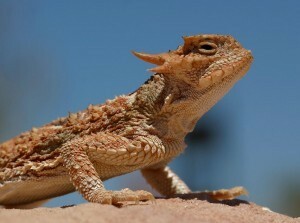 This notch is unique to the short horned lizard. All other horned lizards have a more or less continuous collar of horns across the back of the head. Whether the horns of horned lizards are short or long, they offer another defense against predators, making horned lizards difficult for birds and snakes to swallow. One more defense which some horned lizards have is the unusual ability to squirt fine streams of blood from their eyes. Only a few species are able to do this; and our short horned lizards are not among the species endowed with this capability. In the evening, horned lizards wiggle their way into the soil or sand and spend the night buried for protection and warmth. Winter, to the horned lizard, is like a very long night during which the buried lizard hibernates. Horned lizards mate in the Spring after coming out of hibernation. Our short horned lizard mothers carry their fertilized eggs to term and give birth to baby lizards after a gestation period which can last up to three months. A mother short horned lizard gives birth to her babies one after another with only a few minutes between births. And, she may give birth to as many as four dozen babies. At birth the babies are surrounded by liquid encased in a transparent membrane. A minute or so after birth, they struggle to break through the membrane and take their first breaths. Within half an hour after birth the baby short horned lizards are fully active and on their own. Short horned lizards are unique in having live births. All other species of horned lizards lay eggs in well concealed underground nests, instead. 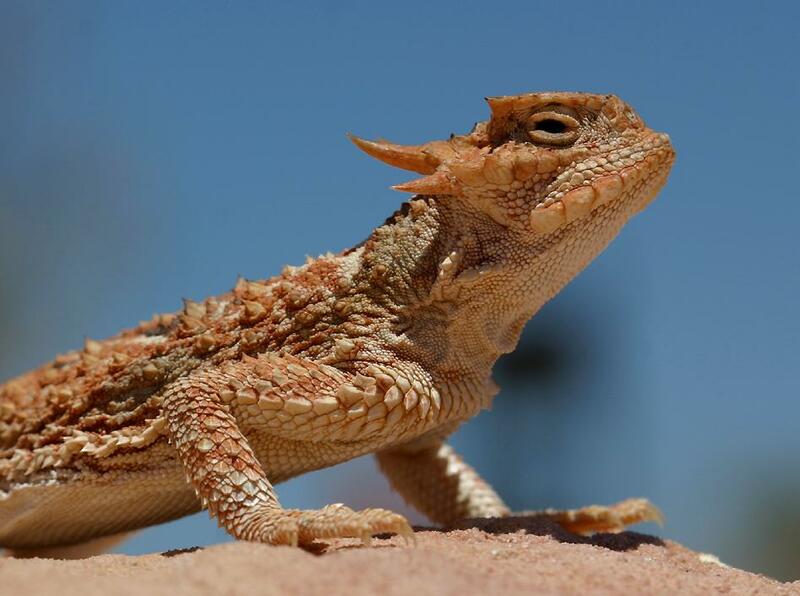 Because of this, the other species are limited to hotter climates than the short horned lizard. With Bott Park now covered by sod and the horned lizards’ roadside homes having been usurped by curbs and sidewalks, the Westside urban habitat of the horned lizard has been reduced over the years. The eastern edge of the Red Rock Canyon property, along the base of the hogbacks, is still a place where we will be likely to find horned lizards.